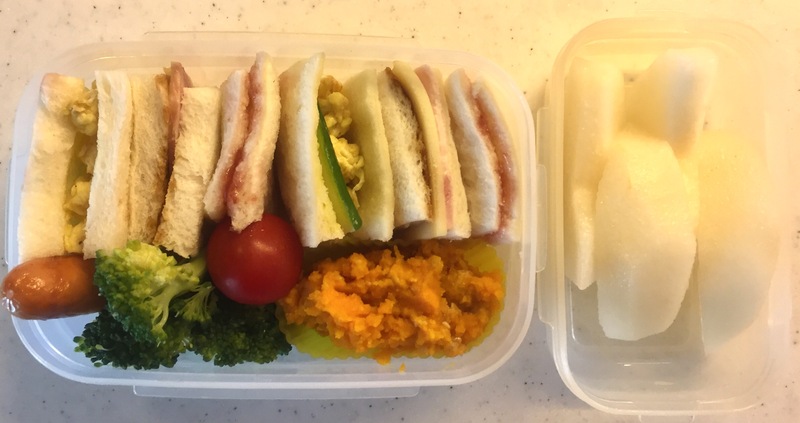 I hardly pack sandwiches for my daughter’s lunch. I have a reason for it; I’m afraid of overfeeding bread for our girl. Having a Dutchman in our household, we have bread for breakfast, almost everyday. We eat thin slices of bread and/or buns, with accompaniments such as cheese (preferably Gouda), ham, jam, unsweetened peanut butter, and this heavenly chocolate sprinkles called “Hagelslag” that the most of Dutch people love. If I have time I’d serve fruits and yogurt, but my husband is happy as long as there is bread on our breakfast table. Anyway, as a very rare occasion I ended up buying sandwich slices at a bakery nearby yesterday, since all the other bread was sold out (anyone from Central Tokyo, you may want to check out this tiny but beautiful bakery called Panetteria Kawamura). And this made me think of making sandwiches for lunch for a change. I thought it would be easy and quick, and I could even save some time in the morning. The part of making sandwiches was easy, how can it not be, but the real problem was with packing. I cut the sandwiches into quarters so that it would be small enough for my little girl to hold it with one hand and is also visually appealing. But the sandwiches kept falling apart when I tried to pack them while attempting to hold them up vertically. I’ve seen it many times in various bakeries where they are packed nicely and standing straight in a plastic sandwich box. I didn’t realise how hard it was to pack bread in a neat manner. There must be a trick for it, but I couldn’t figure it out today. As a result, instead of saving time, I totally ran behind schedule and had to rush like a headless chicken to get ready to walk my daughter to school.